Los Angeles River bike path at Willow Street Bridge. Photo courtesy of A. White-Kjoss. 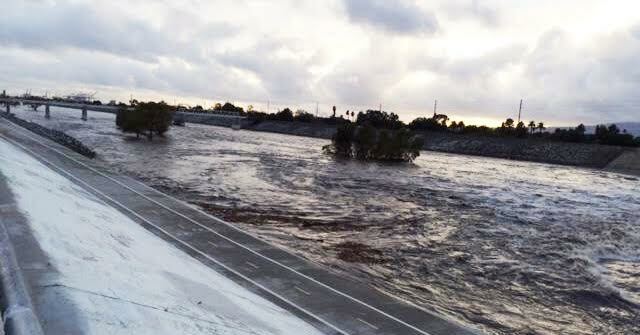 Long Beach cyclists hoping to use the Los Angeles River’s bike path will need to reschedule plans as the Los Angeles County Department of Public Works declared the area closed late Wednesday morning due to heavy rain in the region. Bike paths along the San Gabriel River, Coyote Creek, Compton Creek, Rio Hondo, Dominguez Channel and Ballona Creek will also be closed. Southern California is in the middle of a series of storms this week as part of the El Niño effect caused by warmer Pacific waters, according to the National Weather Service. A slight chance of thunderstorms are predicted over coastal waters on Wednesday into evening hours, the NWS previously stated. Long Beach’s Swiftwater Rescue Team has been deployed due to the rain to monitor the entire city in anticipation of an incident. They have escorted various homeless encampments out of the San Gabriel Riverbed. Long Beach Fire Department (LBFD) spokesperson Jake Heflin advised residents to stay at home and off the road if they’re in a position where it’s not necessary to travel. According to the LBFD, residents can pick up and fill up to 10 sandbags at certain fire stations throughout the city, until they run out. Residents are asked to call 562.591.7631 to find out which nearest fire station has them available. LA River, San Gabriel River, Coyote Creek, Compton Creek, Rio Hondo, Dominguez Channel, Ballona Creek bike paths closed due to #LARain.